Customer engagement for small business owners starts with being accessible to their customers. Many owners and managers let their front-line staff handle customer engagement by face to face interaction. While delegation is important, without direct customer interaction leaders lose the pulse of their customers. This leads to failing to make the correct critical business decisions by not understanding what is important to your customers. To become a successful leader of your small business, you show look to other successful leaders. Small business owners may want to study the example of the President on customer engagement, customer service, and customer accessibility. 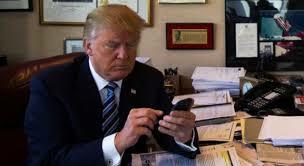 Our newly elected President Donald J Trump displays a unique talent of staying connected to his customers. Rarely does he excessively shield himself from direct feedback and interaction. In recent reporting, President Trump will answer cell phone calls from reporters, even when the caller id is blocked. Also against advice President Trump is still using his @realDonaldTrump Twitter handle as well as @POTUS. Emotion-based tweets inspire and inform his supporters. While this accessibility is rapidly changing by new security practices being put in place by secret service, President Trump will still amaze people by avoiding isolation from his customers. Start being accessible to your customers and your customer engagement efforts will pay off. You may not become President but your small business may achieve exciting results.